If you own a vehicle with part time 4WD the need for different rpm front and rear represents a major problem. The transfer case will power the front and rear drive shafts with same rpm and is not able to satisfy the front axle's need for more rpm. 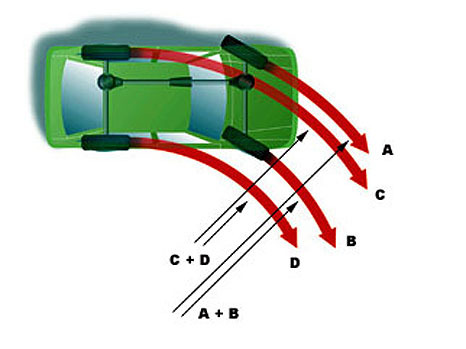 Remember, the combined rpm of front wheels (A+B) is higher than the combined rpm of the rear wheels (C+D). Only full time 4WD systems are able to negotiate the needs of front and rear. So, with part time 4WD engaged your front wheels are forced by good traction on the ground to rotate faster than the rear - but since the front drive shaft delivers only the same rpm as to the rear there is a fight between front wheels and rotational force coming from the front drive shaft. The front drive shaft in effect tries to slow down the front wheels. This results in very wide turns (understeer) and dangerous handling on pavement. The name "part time" derives from its use. It can only be used part of the time - most of the time (for most uses) it has to remain in 2WD. Only "full time" - notice the name - can be used full time for all uses. The fight between front wheels and transfer case also makes 4WD performance suffer - in a turn the front wheels are not pulling like they should. They are in effect hindered by the front drive shaft. The slowing effect caused by front wheels stresses all components between wheels and the transfer case. It causes mechanical components to bind instead of moving freely - this situation is called "axle binding" ,"driveline binding" or "driveline wind up". First indicators while driving is a hard steering feel and the vehicle displaying jerky movement. Shifting back to 2WD will become impossible (gears and levers are extremely forced together). Continued 4WD use on dry surfaces will cause the weakest links to break (U-Joints, axles, differential gears, transfer case gears and chains, bearings, drive shafts). When starting from a standstill with sharply turned wheels: The need for higher rpm in the front will most likely prevent you from getting started at all. If you step on the gas really hard (plus slipping your clutch) you might get the vehicle moving with spinning rear wheels but stress on all driveline components will be dangerously high. Chance is that you will break something. When traveling with part time 4WD on high traction surfaces like asphalt, concrete, etc. handling of the vehicle will become unsafe (understeer) and the "driveline binding" will eventually cause component failures. Part time 4WD should not be used on high traction surfaces! Even when going straight most of the time, slight differences in tire pressure front to rear or vehicle load resulting in different axle speeds will cause "wind up" and eventually damage. When traveling with part time 4WD on low traction surfaces like sand, gravel, mud, snow, etc. handling of the vehicle is unsafe (understeer) as well, but not as severe as on pavement. The slowed down front wheels simply skid a little on gravel, sand, snow, etc. during a turn. This in mind you should always approach difficult off-road obstacles in a straight line otherwise you might lose some of the much needed traction due to wheel slip on your front wheels. Do not listen to guys who tell you it is OK to use part time 4WD on pavement! Severe damage will be the result. Here is another important fact: Since front and rear axles are not able to rotate independently ABS will not work properly. How is part time 4WD performing off road?